Denise Bresson "Denny" Smith, the mainstay of many of the Los Angeles Times columns written by her husband, Jack Smith, died Monday. She was 83. Smith died of pancreatic cancer in the Los Angeles hillside home she shared with her husband from 1950 until his death on Jan. 9, 1996. Although rarely named, Denise Smith was the most oft-mentioned character in the column her husband penned from 1958 until Christmas Day 1995. She was the Powerful Katrinka in charge of household chores, tour director for family travels or his partner in everyday adventures such as expanding their Mount Washington home or building a vacation house in Baja. Despite his tongue-in-cheek depictions of her as the household drudge honored to be his servant, she was integral to the life he reported. "His" annual winter search for great blue herons, for example, became the Denny and Jack Smith Bird Walk at Descanso Gardens. "You couldn't read Jack's column all those years and not believe he was married to one terrific person. He let us know in every line he wrote about her," Times writer Jerry Hicks said after Jack Smith's death. Readers became so intrigued by Denny Smith that several wrote to thank the newspaper for printing a photo of her with her husband in 1992. "It means so much to the family to at long last see Denise Smith," one wrote. "We've felt we knew her. From daily reading and loving Jack Smith's articles, each of us feels a relationship with Jack's family and wife." Born in Pond, Calif., near Bakersfield, the daughter of French immigrants was a senior at Kern County Union High School when she met Jack Smith, then a sportswriter for the Bakersfield Californian, on a blind date. "For me," he wrote in a March 26, 1989, column as he contemplated their 50th anniversary, "it was love at first sight." The Smiths married shortly after her high school graduation and moved to Honolulu, where he worked the night news desk of the Honolulu Advertiser and she was a communications secretary for Radio Corp. of America. "I must admit that I persuaded my wife … not to go on to Berkeley, although she was an excellent student and had the grades for it," her husband wrote half a century later. "I thought she would be happier as the wife of a newspaper reporter. If the women's movement had started 15 years earlier, she might have been chairman of IBM." Instead, Denise Smith waited out World War II while Jack served in the Marines, then accompanied him to San Diego and to Los Angeles for his newspaper jobs. In 1950, they bought a postwar cracker-box house for $8,000 in semirural Mount Washington. Through its many well-chronicled renovations, she brought up their sons, Curt and Doug, and volunteered for the PTA in their series of schools, also serving as its president. Only after the boys went to college did Denise Smith begin her own professional career — first working for United Way and then for 26 years for the Southern California Counseling Center, where she became administrator. She had remained active on Los Angeles Philharmonic committees and with the Los Angeles Assistance League and the Historical Society of Southern California. Her last public appearance was at a Jan. 22 celebration for the completion of fundraising at the Mount Washington Elementary School where a planned multipurpose room, library and community center will be named in honor of Jack and Denny Smith. The groundbreaking for the project will take place at 1:30 p.m. Friday. In addition to her two sons, she is survived by five grandchildren and one great-grandchild. According to her wishes, there will be no funeral. The family has asked that, instead of flowers, donations be sent to the Jack and Denny Smith Memorial Fund for Literacy at the California Community Foundation, 445 S. Figueroa St., Suite 3400, Los Angeles, CA 90071. 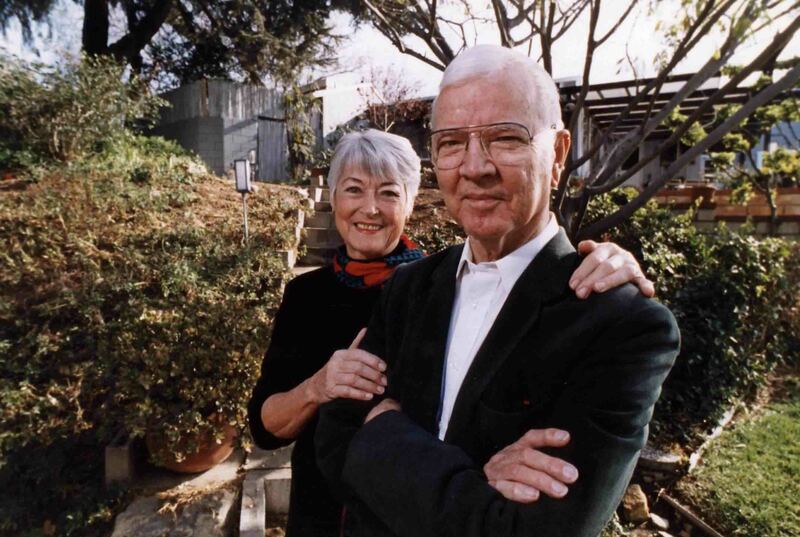 Denise Bresson Smith, a prominent Los Angeles socialite born in Kern County and the wife of the late Los Angeles Times columnist Jack Smith, died Monday morning after a long struggle with pancreatic cancer. Bresson Smith, 83, was born in Pond and grew up in east Bakersfield, in a California bungalow on Niles Street, said son Doug Smith. Bresson Smith was attending Kern County Union High School in the mid- 1930s when she met Jack Smith, then a sports writer at The Californian. "For me, it was love at first sight," Jack Smith wrote in his March 26, 1989, Times column, according to Doug Smith, their son. "Our courtship was incredibly romantic. I was a dashing figure -- a sports reporter on the local daily." Jack Smith often wrote about his wife in his suburban column, working her into house remodels, daily chores and travel chronicles, Doug Smith remembered. Jack Smith died in 1996 of congestive heart failure, Doug Smith said. And as Smith wrote, his wife became involved in the community. She raised two sons, Doug and Curt, and became president of the parent club at each of her sons' schools. She eventually started a career in volunteer-based administration at the Southern California Counseling Center, where she raised hundreds of thousands of dollars to keep the doors open. Over the years, she befriended numerous famous Californians, including former Times publisher Otis Chandler, actor Charlton Heston and science-fiction author Ray Bradbury, according to Doug Smith. "She's one of the most wonderful women I've ever known," said Bradbury over the phone on Monday. "One of the few women I've ever met in my life who'd I'd have said I'd love to have had her as my wife. She was wonderful. She was incredibly bright. She was intelligent and informed and kind." Their son Doug remembered her for her strength, both of will and muscle, bred from the "French mountain stock," he said. Her father, Ernest Joseph Bresson, was born in the Alps and her mother, Suzanne Casenave, came from the Basque Pyrenees. She often did the chores around the house -- unclogging drains, gardening, clearing brush and chasing the dogs when they got out, he said. Even when she was dying from her illness, she still asked to be taken to symphonies and gardens, fighting through pain to visit. "The caretakers thought she should have died long ago, but her heart was just strong," he said. Her son also remembered her for her elegance. "She was always scooting around in a white BMW," he said. And every year, he said, she sent 400 valentines and 400 Christmas cards to her friends. She leaves sons Curt and Doug Smith as well as grandchildren, nieces and nephews. Several still live in Bakersfield and Oildale. According to her wishes, there will be no funeral, Doug Smith said. In lieu of flowers, donations should go to the Jack and Denny Smith Memorial Fund for Literacy at the California Community Foundation, 445 S. Figueroa St., Suite 3400, Los Angeles, CA 90071.